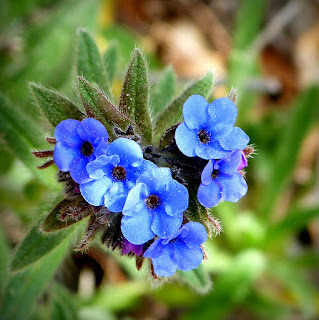 Its flowers reminds us the alpine forget-me-not flower (Myosotis alpestris) and it makes sense because they belong to the same family, while the extracted colour from its root is deep red! Today the post is dedicated to alkanna tinctoria which belongs in the flowering plant family Boraginaceae, a therapeutic herb known since antiquity, native to the eastern Mediterranean. The ruby colour of the plant’s root is due to alcannine which is soluble in vegetable oils, floral waters and alcohol. Traditionally alkanna was used to colour wines or give the corks a vintage look or even colouring clothes. Few people know though that alkanet root is very popular the last years in the task of handmade cosmetics because of the colour which it is used in lip balms leaving a soft pink shade on your lips or in blushes for slightly pink cheeks. We can compare alkanet to henna since it can be also used in hair. But its use does not stop here. Beyond the natural deep red pigment of the plant, alkanes has been used to treat and heal skin issues such as eczema, acne, irritaitions or even wounds, burns and infections. It has antimicrobial and antiviral properties and this is why pharmaceutical companies in Greece use alkannine, the main ingredient responsible for the colouring but it fights drastically bacteria and fungi. Alkanet oily extract provides also anti-acing and anaplastic properties! Add the alkanet root powder and the oil in a beaker and place it in nail marie with a mild fire for 2 hours. Drain the oil with a coffee filter and when the oil cools down, add vitamin E in order to avoid oxidation. The alkanet oily extract is ready to use it in balms, creams, lotions, soaps, blushes etc. Unfortunately, there has not been much scientific research on alkanet root properties so I can give more information, but I know for sure that it is not allowed to be used by pregnant women as well as people with liver problems.